These basic commands are sit, stay, down, come, leave it and heel. Basic training methods use a "treat" as positive reinforcement to lure your dog into a position, and then a marker, such as a clicker or marker word, to let him know the exact moment he has properly done the command. Positive reinforcement is ideal for the Shih Tzu because it encourages your strong willed companion to complete the command you requested. Not only will you have a better relationship, but these important commands can keep not only your Shih Tzu but yourself and others, safe when encountering potentially dangerous circumstances. Basic dog training builds upon itself, and once you've mastered these very basic commands, you can use these skills for a variety of tricks and advanced training. Place a treat between your thumb and forefinger with your palm facing up. Place it directly in front of his nose until he focuses on it. Move you hand slowly over your his head towards the base of his tail. As soon as your his bottom hits the ground, mark the behavior with a clicker or marker word and give him the treat. Once he consistently sits, try mimicking the same hand gesture without his reward between your fingers. Gradually adjust your hand luring so that the final hand signal for sit will be a flat palm facing up, raising it up about two to three inches. Basic dog training command for "sit"
Start with him in the sit position. With a treat between your thumb and forefinger, again hold it at his nose and move it slowly towards the floor. Once his head is at the ground, move your hand slowly towards you so he has to follow it out. If at any point his bottom lifts off the ground, reset and try again. When his legs are bent and his chest touching the floor, mark the behavior and give the reward. Once he is consistently laying down on your command, practice without the treat in your hands. As he becomes more comfortable with the command, begin using the final hand signal, a flat palm facing down, moving your hand about 2-3 inches downward. Again start with him in a sitting position. Place your hand, flat palm in front of him like a stop sign. Hold this position for 1 second. Mark the behavior and use a treat to lure him out of sitting position to release him from the stay. If at any point he breaks the stay before you tell him to, reset and try again. As he is responding consistently, slowly start adding more and more time to the stay. Use small increments, 2 seconds, 5 seconds, 10 seconds, 15 seconds, 20 seconds, 30 seconds, etc. When he will consistently stay for 30 seconds, then switch to practicing distance. Step one foot away from him and then immediately back. Mark and release him. Slowly increase the distance between the two of you, 1 step, 2 steps, etc. Once you have reached 10 steps, you can add distance and duration together. Take one step away from him, wait 5 seconds and then step back to him, mark and release. When he is consistently responding to duration and distance, you can start adding distractions such as tossing a tennis ball, or being in new environments. Remember that when you add in distractions, reduce the distance and duration of your stay to set him up for success. Come when called is an extremely important behavior, so there are a few extra points for the behavior to be effective. Keep the cue positive, you always want him to be excited to come to you. Do not use the recall word if you know he won’t respond. Try calling your his name first to see if he will react to you. Use extremely high value food for recall. Find something your he LOVES, like diced chicken or meatball, and use that only for working with recall. If he gets distracted after you’ve called him, go to him and use the food to lure him back to where you originally called him from. Make sure he learns to go to where you called him. Never chase your dog. This will only cause him to run away from you. If you need him to follow you and recall won’t work, try running in the opposite direction from him to get him to chase you. Start your training session by showing him that you have a high value reward. This will help him become more engaged in training and more apt to respond. Check to see if he will respond to you. Call his name. If he looks to you, proceed to the next step. If not, go get him. Say the recall word "Come" or "Here" once. You can make other silly sounds, call his name, or even a toy that squeaks. Use a squeaker to attract their attention. Dogs respond to enthusiasm, so don't be afraid to get loud and excited. Crouch down and raise your arms in the air to help encourage him. As soon as he comes to you, use your marker. This will encourage him to continue coming to you. Once he comes to you, reward him. As he gets more comfortable with recall, ask him to sit when he gets to you and then give it. This is by far one of the most important basic command to master. You hear about dogs getting loose all the time, and you want to make sure he will come back to you right when you call him. This command will teach your canine friend from putting things in his mouth that he shouldn't. Start with two different types of rewards, something low value for the leave it command and your regular training reward. Your low value item can even be plain kibble to start out. The most important thing is that HE SHOULD NEVER GET THE 'LEAVE IT' ITEM. As soon as he looks away from the treat, mark the behavior and reinforce him with his regular training treats. Once he is consistently responding to "leave it", make the behavior harder by placing the treat on the ground and covering it with your hand each time he goes for it. To make the behavior even harder, drop it on the ground and cover it with your foot. This basic dog training command is a good one to teach. It teaches him to walk quietly beside you, and not pull on his leash. Start with him sitting next to you. Tell them “heel” and begin walking. Anytime his front legs are not parallel to your legs, stop and have him sit and start again. Periodically, when he is walking next to you, mark and reward the behavior. You can try slathering peanut butter on a wooden spoon and offer him a few licks as a reward, instead of leaning down to Shih Tzu height. 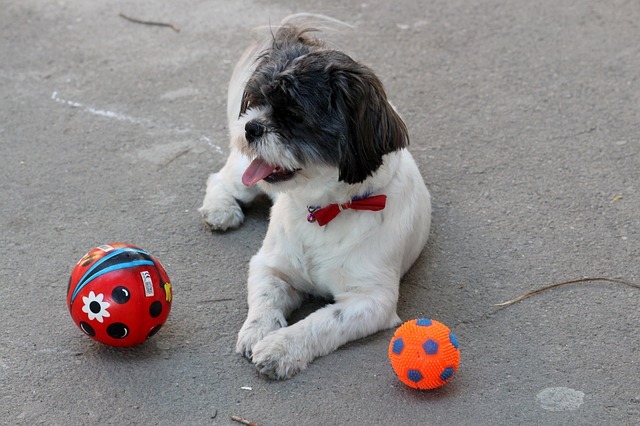 Training your Shih Tzu is equal parts training and persistence. Once you’ve mastered the basic dog training commands and have found the way to work with him instead of against him, there’s an endless world of training possibilities.